Christmas is everywhere. Seems like it creeps into stores and advertising earlier and earlier every year. This year I noticed on October 30th, big box retailers had already taken down the Halloween products and replaced them with Christmas. Forget Thanksgiving. We’ll just skip over November and go straight to the big money maker, right? Black Friday has now become Thanksgiving morning. Seriously? Stores advertising to come Thursday morning, since you’re not doing anything anyway, and start the holiday spending. Cyber Monday started a week before Thanksgiving, where online retailers inflate their prices and then mark them down to make you feel like you’re getting a deal. No wonder the world is struggling with anxiety. We’re not even taking the time to do the things that lower anxiety. Well here are 3 gifts and gadgets that can help reduce anxiety overall in your life this coming year. Parents now report that screen time and tech usage is the highest concerns for their youth today. Even more than drugs, alcohol and sexual activity. This article explains why tech is an ever growing concern and what some families are doing about it. The argument is that we live in a different world, and we can’t live without tech now. Is that really true? More and more families are realizing that’s actually not true. It’s just what big retail wants you to think. I was in class yesterday, and the instructor asked us to hold up our cell phones. Out of 24 high school juniors and seniors there was only one student that didn’t have a phone. When it came out that he was tech free, at least 10 other students praised him and expressed they wish they didn’t have a phone too. It’s pretty obvious more and more of us are realizing how tech is taking over our lives in a bad way. But how can a high school senior survive without a cell phone? You still need to call friends, and borrowing your mom’s phone to ask a girl out on a date just isn’t cool. The solution is VoIP, Voice-over Internet Protocol. Sounds all high tech, but really it’s the new way to go old-school. It’s basically a land line, a box that plugs into your wifi router and has a phone jack that you connect an old phone to, (yes you can still buy old land line phones, especially at second hand stores). There’s lots of options out there, but here’s one we use at our house. It connects to your google voice account that comes with your student gmail account. Basically for what you pay for one month of cell service, you can cut the cell phone shackles and still have your own number where friends can reach you at home. Mmm, just smell the freedom!! But what about text? That also comes through your google voice account, but what you’ll find is that friends will actually call you more when they know it’s easier to talk! The Gift of Talk. But text is so much more convenient! 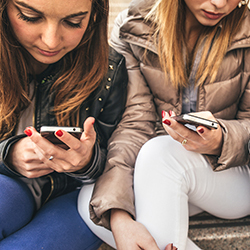 Maybe in very limited situations, but studies show that texting actually increases anxiety. Human to human discussion actually decreases anxiety. So it is indeed possible! Abandon the mobile and embrace your freedom. Independence isn’t given. It must be taken. It is defined as: freedom from the control, influence, support, aid, or the like, of others. We have become a people bound by digital support and aid. A little while ago I was trying to find a friend’s house in a newly developed neighborhood. Siri thought she knew where she was taking me, but I wound up in the middle of nowhere. I realized that without the maps app on my phone I was lost. Anxiety and frustration started to set in. I also realized I hadn’t even paid attention to any of the streets along the way. I just turned right and left when Siri told me to and hadn’t relied on any of my own directional awareness. Since I knew about where the house should be and had a house number, I turned off the maps app and turned on my inner explorer. Sure it took a little longer than normal, but by not relying on the support and aid of my phone I better connected with my surroundings. I learned street names and found how they interconnect. I identified landmarks and understood my position relative to mountains, bluffs and the sun. It was so liberating to find the address on my own! Anxiety and frustration were replaced with confidence, power and independence. Sure, maps have helped explorers throughout time, but our digital assistants have enslaved us to where we can’t even venture out within the confines of a well designed city that is based off of grid coordinates. In many ways we have cashed in our independence for convenience and ease. A solution for this and a fun gift idea could be a good old road atlas. It’s what people used before Siri. Here is a link to download and print free street maps for Utah to keep in the car. You’ll find as I have the more you choose to use physical assistance rather than digital assistance, you grow in confidence in your abilities to navigate in life and empower your independence. 10 years ago Jack Johnson released a song named “Angel” that included the lyrics, “She gives me presents, with her presence alone” Who knew that 10 years later that that would actually be a Christmas gift. Homes all over are including cell phone baskets that encourage residents and visitors to be present with those that are present. The telephone has existed in American homes for more than 140 years. On March 10th, 1876 Alexander Graham Bell made the first phone call to his assistant Thomas Watson and said “Mr. Watson-come here-I want to see you.” Isn’t it interesting that the first phone call was to invite face to face interaction. For over a hundred years the phone has been an effective tool to improve human communications. Is it still improving communications today? A new word has emerged that would suggest not. Phubbing. Defined as: to ignore (a person or one’s surroundings) when in a social situation by busying oneself with a phone or other mobile device. This is exactly opposite of what the first phone call achieved. You even see it portrayed in popular movies now like “Daddy’s Home 2”, where you’ve got the kid that is constantly on their phone even while tubing down a snowy hill. Sounds ridiculous, but just look around social settings and you’ll recognize phubbing more and more. Whether it’s a conscious decision, family commitment or a phone basket in the home, giving the gift of presence will improve your social interactions and help build healthy connections which is proven to reduce anxiety. Christmas is everywhere and I find it’s fantastic. Especially the more and more we unplug from the digital world, and focus on spending quality time together. The advertising for the tech world is tricky and deceiving. Just yesterday I considered buying a smart bluetooth speaker for Christmas for a loved one. In the product video, it showed kids playing all day alone in their room with the speaker and the parents downstairs on their phones controlling the smart speaker. The kid asks the device questions, asks the device to tell them jokes, and asks the device to play music they can dance to. All the while the parents stand there looking satisfied that they are good parents for getting their kids this gadget, but have not personally participated in learning with their kids, playing with their kids, or getting up and dancing with their kids. I felt sad to think I could lose that quality time with my family because of a bit of technology. So for this Christmas our family is focusing on gifts that will help us grow closer and stronger emotionally. Check out the Emotionomemter© and this video of what the professionals at Life Launch Centers have to say about excessive media use and when it is unhealthy. 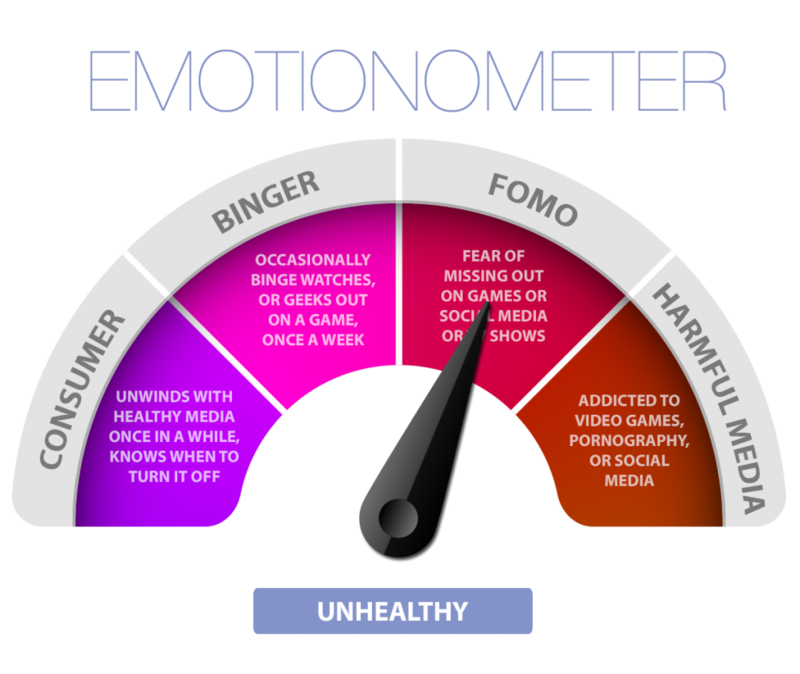 Use the Emotionometer to determine where you are and when you may want to consider additional help.